Formation thickness maps of the Navajo Sandstone, the principal component of the Glen Canyon Group, were digitized from Freethey and others (1988) and gridded (c3glencanyon). Freethey, G. W., Kimball, B. 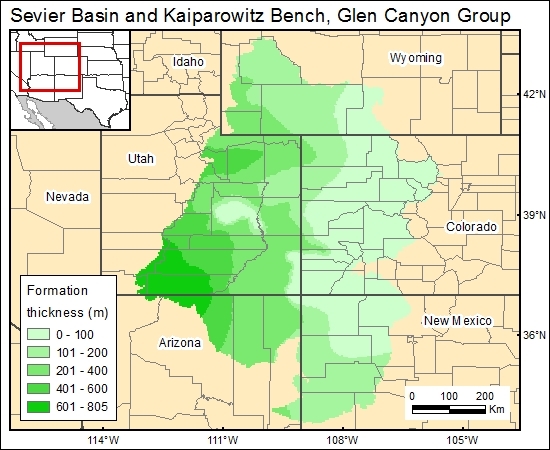 A., Wilberg, D. E., and Hood, J. W., 1988, General hydrogeology of the aquifers of Mesozoic age, upper Colorado River basin—excluding the San Juan Basin—Colorado, Utah, Wyoming, and Arizona: U.S. Geological Survey, Hydrologic Investigations Atlas HA-698, scale 1:2,500,000, 2 sheets.